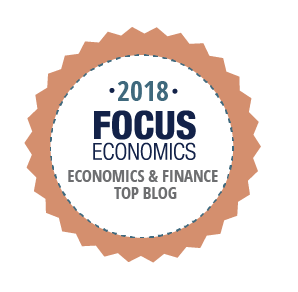 Anyone who makes an effort to study monetary economics quickly encounters the concept of Gresham's law, or the idea that bad money can often chase out good. Gresham's law is usually used to explain the failures of bygone monetary systems like bimetallic and coin standards. But the phenomenon isn't confined to ancient times. I'd argue that a modern incarnation of Gresham's law is occurring right now in Zimbabwe. Zimbabwe's stock market has blown away all other stock markets by rising 30% in the last month-and-a-half. The chart below compares the Zimbabwe Industrial index to the U.S. S&P 500, both of which are denominated in U.S. dollars. I'd argue that the extraordinary performance of Zimbabwean stock is an instance of Gresham's law. With the imminent arrival of newly printed Zimbabwean paper money, known as bond notes, "bad" paper money is poised to chase out "good" money, stocks being one of the few places where Zimbabweans can protect their savings. What follows is a quick summary of bond notes (alternatively, read my two earlier posts). The Mugabe government, which began discussing the idea of a new paper currency earlier this year, says that it will issue low denomination bond notes into circulation before the end of the November. Recall that Zimbabwe has been using U.S. dollars since 2008 after a brutal hyperinflation destroyed the value of the local currency. The regime claims that a $1 bond note will be worth the same as a regular $1 Federal Reserve note. It says it has received a U.S. dollar line of credit from the African Export-Import Bank that will guarantee the peg. Enter Gresham's law, which says that if two different media circulate, and the government dictates that citizens are to accept the two instruments at a fixed ratio—say via legal tender laws—then the undervalued medium will disappear leaving only the overvalued one to circulate. So called bad money drives out good. Medieval coinage systems were often crippled by Gresham's law. For instance, say a new debased silver penny was introduced into circulation along with existing pennies. Because it contained a smaller amount of silver, the new penny was worth less than the old. However, legal tender laws required that all pennies be accepted without discrimination in the settlement of debts. Medieval debtors would thus always prefer to discharge debts with new pennies rather than old ones since they would be giving up less silver. The result was that only "bad money," or debased coinage, circulated. Because "good money," or undebased coinage, was undervalued, people either hoarded it, sent it overseas, exchanged it on the black market at its true value, or melted it down. The same conditions that created Gresham effects in medieval times are emerging in modern day Zimbabwe. Rather than two different medieval coins, we've got two different types of dollars; bond notes and regular U.S. cash. The next ingredient for Gresham's law is a decree that dictates the rate at which people are to accept the two instruments. In Zimbabwe's case, the government has already declared that bond notes (once they appear) are to be legal tender along with U.S. Federal Reserve notes, which means that Zimbabwean creditors will have to accept bond notes at par as a means of discharging all debts, even if they'd prefer the genuine thing. Since a chequing deposit is a debt incurred by a bank to a depositor, this means that Zimbabwean banks can—in theory at least—meet depositors' demands for redemption by providing bond notes. So a Zimbabwean bank deposit is no longer just a claim on actual dollars, but a claim on some mysterious as-yet unissued Zimbabwean government liability. The last ingredient for Gresham's law is an overvaluation of one of the two media. In Zimbabwe, this will most likely occur as the market value of bond notes falls below that of genuine U.S. dollars. While many countries maintain successful currency pegs to the U.S. dollar, they have the resources to do so. I'm skeptical that the isolated and corrupt Mugabe regime has the resources to pull a peg off. Bond notes have yet to be issued, but because existing bank deposits—or electronic dollars—are likely to be payable in this new paper currency, we can think of deposits as a surrogate for the bond note. The first bit of evidence that Zimbabwe has run into Gresham's law is that physical U.S. dollars are beginning to disappear from circulation, replaced entirely by electronic dollars. Why might this be happening? Start with the assumption that Zimbabwean bank deposits have become "bad," meaning they are worth less than actual physical dollars. If a Zimbabwean citizen needs to buy $100 in groceries, and the grocer is required by law to accept deposits and cash at the same rate, our citizen will naturally spend only overvalued deposits and hoard "good" and undervalued cash. In fact, we have direct evidence that deposits have become "bad". In the black market, dealers will only sell physical cash at a premium. I've seen anywhere from 5% to 20% mentioned. Oddly, Old Mutual trades in London for around $2.30 per share (after converting into US dollars) whereas it is valued at $3.20 in Zimbabwe. Here's the article that first tipped me off to this. As the chart below shows, this rather large gap has progressively emerged as the introduction of bond notes becomes more likely. Why is no one arbitraging the difference by purchasing Old Mutual in London for $2.30, then transferring it to Zimbabwe to be sold for $3.20? The large discrepancy likely reflects the growing risk that any dollar sent to Zimbabwe is likely to be trapped and re-denominated into a bond note. The ratio of the two Old Mutual listings implies that the exchange rate between genuine U.S. dollars and dollars held in Zimbabwe is around 0.72:1, i.e. one Zimbabwean U.S. dollar deposit is only worth 72 cents in genuine U.S. dollars. While transaction costs and other frictions may explain part of the gap, this is still an incredibly wide discount. Once all the ingredients for Gresham's law are in place, inflation is never far behind. Because U.S. dollars are being undervalued, Zimbabweans will refuse to buy stuff with anything other than overvalued deposits. If they don't update their sticker prices, retailers will soon discover that they are receiving fewer real dollars than before. To maintain the real value of their revenues, they will have to mark up their prices, thus compensating for the fact that only "bad" money is flowing into their tills. While retail prices are usually sticky, financial prices are not. And that may be why we've seen such a huge jump in Zimbabwean stock prices but little movement in Zimbabwean consumer price inflation. With Gresham's law beginning to push good money out of circulation, nimble owners of Zimbabwean shares are demanding a higher share price from potential share buyers in order to compensate for the risk of holding soon-to-be issued bond notes. Less nimble retailers have yet to demand this same compensation from their customers. Don't expect this to last; consumer price inflation can't be too far behind asset price inflation. Prime Minister Narendra Modi's aggressive demonetization of the 500 and 1000 rupee note is causing plenty of chaos in India. A general shortage of money has emerged, massive lineups have formed at banks, and cash-based business has come to a standstill. All this would seem to indicate that the process has been ineptly carried out. But I'd argue that the problems listed above are exactly what one should expect of a well-designed aggressive demonetization. Chaos is a feature, not a bug. As I mentioned in my previous post, a regular demonetization isn't meant to harm anyone. To ensure that no one is left behind, legacy note are gradually replaced with new ones, a process that often takes decades to carry out. See for instance the below pamphlet published by the Bangko Sentral ng Pilipinas (BSP), the Philippines central bank. 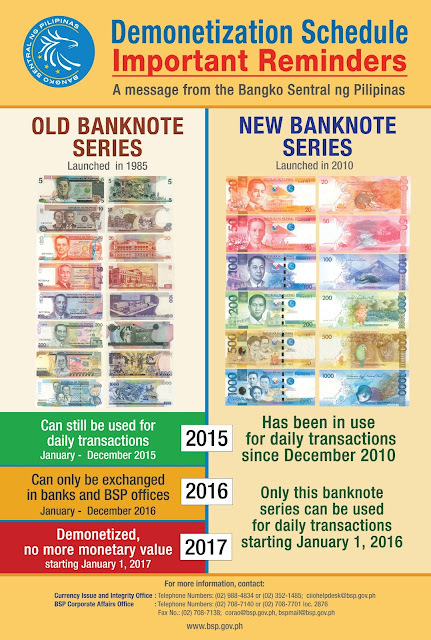 It shows a slow and staged approach to replacing old peso notes with new ones. The goal of an aggressive demonetization like Modi's is exactly opposite: to leave people behind. To get this effect, the demonetization has to begin suddenly and end quickly. Why didn't Modi make more preparations for the retirement of the Rs 500 and 1000 note? For instance, to reduce lineups at banks and ATMs the Reserve Bank of India could have begun supplying banks with extra 100 rupee notes several weeks ago in order to ensure that there was sufficient supply come November 8. And maybe the RBI could have nudged banks to purchase more safety deposit boxes to hold cash and hire extra staff to handle the rush. Or take ATMs. One reason for lineups is that with the demise of the 500 and 1000 note, ATMs are running at a fraction of their capacity. Indian ATMs have four "cassettes", each holding around 2000 notes. Two cassettes are typically configured for the old 500 rupee note, one for the legacy 1000, and one for the still-existing 100. They typically do not dispense 50s. Thus the maximum an Indian ATM can provide in a post-demonetized India is one cassette worth of 100s, or 200,000 rupees (US$3,000). If everyone in the lineup removes 2000 rupees, the daily limit, that means just 100 people can be served. That's peanuts. To get ATMs up to full capacity, all four cassettes need to be dispensing some combination of new 500 notes, 2000 notes, and/or existing 50 and 100 notes. The problem is that each ATM cassette need to be re-calibrated to hold a certain denomination since notes are not uniformly shaped. With every single ATM in the country needing to be modified, and only so much staff trained to do so, it's taking a lot of time. So why didn't the government begin working with ATM companies a few months ago to make all the modifications in time for November 8? This would have surely reduced the awful indignities that regular Indians must undergo as they wait for hours to withdraw cash. Unfortunately, any attempt to modify ATMs ahead of time would have caused Modi's aggressive demonetization to fail. In order to inflict maximum damage on those who depend on "black money" (i.e. income obtained illegally or not declared for tax purposes), an aggressive demonetization needs to be executed suddenly. If rumour gets out that a demonetization is about to occur, the element of surprise will be lost. Those working in the underground economy will simply switch their high value banknotes into low ones ahead of the demonetization, thereby avoiding being damaged. And of course it is the rich, not the poor, who have the best networks for gleaning information. To reduce the potential for information leaks, the number of people 'in the know' needs to be kept to a minimum, and this means that all large-scale preparation—including a huge reconfiguration of the ATM network—must be avoided. So if you support the idea of a demonetization—specifically one that is designed to hurt the underground economy and, in so doing, draw people into the taxed economy--then you should just accept that this was always going to be a messy affair. If it had been a smooth one, then that would have been a sign that it wasn't being effective. Once the dust is settled, India will be made better off by the demonetization. While many Indians in the underground sector will grudgingly comply and deposit their funds in an account only to withdraw that same amount in new notes later, others will keep their funds in the banking system. To change, people sometimes need to be prodded. This should be a shift in the right direction given that a banked economy is stronger than an unbanked one. My back of the envelope calculation tells me that the demonetization will generate real pain on the underground economy. Consider that there are Rs 12.2 trillion worth of 1000 and 500 notes in circulation, or US$181 billion (source). Assume that 40% of these notes, or Rs 4.9 trillion (US$72.7 billion) circulate in the dark economy and lack a paper trail. Further assume that thanks to Indian ingenuity, or jugaad, half of the black money will sneak through the demonetization. That still leaves the remaining Rs 2.4 trillion, or US$36 billion, stranded. That's a painful writeoff! To build and effectively run a nation, a government needs to be able to efficiently collect taxes. Many will shrug off the immense losses caused by the demonetization and go back to using cash as a way to evade to avoid the tax man, especially now that the government has (somewhat puzzlingly) introduced a new 2000 rupee banknote. But a large enough contingent will migrate to the tax-paying economy for good. Once bitten, twice shy. Prime Minister Narendra Modi surprised Indians today by announcing that India's highest denomination notes, the 500 and 1000 rupee, will cease to be legal tender. On first blush, India seems to be enacting Ken Rogoff's idea of cutting down on criminality and tax evasion by phasing out high-denomination notes, which I recently discussed here. But this isn't the case. Rather than removing the Rs. 500, the Reserve Bank of India is replacing it with a new bill. Furthermore, it will also be issuing a Rs. 2000 note, a new highest denomination note. What India is doing is enacting what I'll call an aggressive demonetization. I'd argue that this is an alternative (though not mutually exclusive) idea to Rogoff's. Both schemes are intended to create a logistical nightmare for money launderers; but whereas Rogoff's entails altering the denomination structure of banknotes to get this effect, Modi's aggressive demonetization keeps that structure intact while using note redemption and re-issuance as its lever. To summarize, Indians have just a few weeks to exchange old notes for new ones at banks or post offices. Proof of ID is required and switches are limited to Rs 4000, around US$60. There is no size limit for directly depositing old notes in bank of post office accounts. But of course, this means that the depositor's identity will be known by the bank and transactions will be traceable. Deposits can be made at banks until the end of the year. After that date, the central bank will exchange old notes until March 31, 2017, although this will require some sort of declaration of origin. The point of all this is to suss out anyone with large amounts of cash that has been earned from dubious sources. Say you've got one million paper rupees, worth around US$15,000. If you've got the receipts to show why you have that much cash, then you can safely bring it to the bank. But if you don't, you'll have to get rid of it as quick as you can by spending it, say on gold (or any other good). However, this will be an incredibly difficult task given the fact that there will be many other Indians trying to spend their undocumented Rs. 1000 and Rs. 500 notes on gold at that very same time, and only a limited number of gold dealers willing to accept them. After all, any gold dealer who accepts notes now inherits the same problem: what to do with newly-demonetized banknotes. Any gold dealer who starts to bring in larger-than-normal amounts of paper money to their bank for redemption will surely face questions. To compensate for this risk, gold dealers will either impose a large penalty on cash payments or they'll stop accepting cash altogether. Some undocumented rupees will no doubt be successful in evading Modi's aggressive demonetization, but large quantities will be left stranded. Significant damage will have been dealt to anyone working in the underground economy. If you think Modi's strategy is new, or confined to developing nations, think again. A few years ago, Sweden carried out out a (somewhat less) aggressive demonetization in order to catch illicit cash users. In 2012, the Riksbank announced that all 1000 krona banknotes without foil strips were to be declared invalid by the end of 2013 (each 1000 krona note is worth around $110). Until December 31, 2013, Swedes were permitted to get rid of 1000 krona notes by either using them to buy stuff or depositing them at a bank. To tighten the noose, no anonymous conversions of old notes into existing notes were permitted. Swedes had to have bank accounts, and therefore had to forgo their anonymity, in order to rid themselves of old currency. Anyone who's seen Breaking Bad knows that laundering money takes time and patience. A Swedish criminal with ten million dollars worth of high denomination krona was suddenly faced with a significant problem; how to get this stash back into the legitimate economy within 400 or so days. How tough was this challenge? We know that at the start of 2013 there were fourteen million 1,000 krona notes in circulation (worth 14 billion SEK, or US$1.6 billion). After the expiry date, the Riksbank noted that there were still some three million 1,000 krona notes that had not been redeemed, worth around $330 million. This gives a rough indication of the value of banknotes left stranded by criminals and tax evaders, around 25% of all notes outstanding. 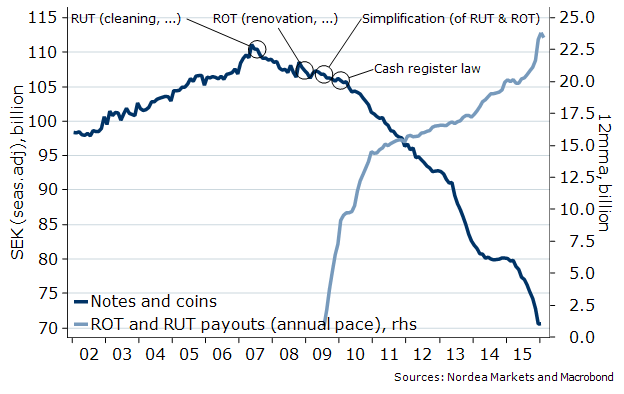 Sweden is the only country in the world in which cash holdings are in decline. Might this have had something to do with the damage inflicted by the Riksbank's 2013 demonetization on the psyche of participants in the underground economy? So let's compare the advantages of Modi's aggressive demonetization to Rogoff's abolition of high denomination notes. If an aggressive demonetization is chosen, then a central bank gets to enjoy high profits, or seigniorage, since it continues to issue an extended range of banknotes, unlike Rogoff's abolition. The more float, or 0% cash liabilities that remain outstanding, the more interest the central bank will earn on its bond portfolio. The central bank also earns significant earnings from 'breakage.' All illegitimate banknotes that never get redeemed are recognized as a one-time unusual gain on the central bank's statement of income. Finally, people engaging in legal activities who enjoy the anonymity afforded by high denomination notes still get to use them; they don't under Rogoff's abolition. Unfortunately, an aggressive demonetization can only be effective for a little while. It's hard to see why people won't quickly re-adopt the highest denomination note as a medium for evading taxes and engaging in illicit activity. In response, the central bank will have to enact an followup demonetizations every few years, but of course the underground economy will do its best to anticipate these by moving into low-denomination notes or foreign paper whenever it suspects something is afoot. "Why not simply increase the physical dimensions of high-denomination notes without jumping through the flaming hoop of elimination? Before 1929, U.S. currency was 40 percent physically larger than it is now. Restoring that size or making it even larger would instantly work the wonders of decades of inflation. The iron law for subverting illicit economies: a percentage increase in physical note size is equivalent to the same percentage increase in the price level."